Have a look at the leaves of trees around you. Chances are pretty good that they don't look healthy. Fading leaves with holes and other insect signs, mold and other fungi and a generally bedraggled look are normal at this time of year. What is wrong with the tree? Probably nothing. Leaves look bad at this time of year for one reason: they are disposable. Leaves are the botanical equivalent of Kleenex - made to be used for a short time and then thrown away. 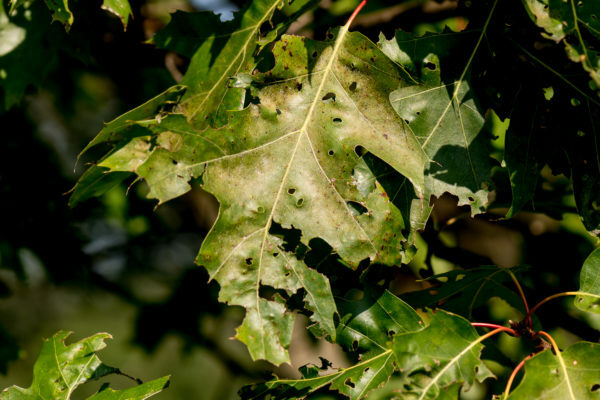 As a result, trees have a limited ability to repair leaves, and the injuries from weather, pests, and pathogens continue to accumulate through the growing season. These sad-looking leaves are actually the beginning of a complex series of steps that trees take to get ready for winter. The most important process in getting ready for autumn is for the tree to withdraw critical nutrients into the stem or roots. For a tree to toss away leaves rich in protein and other forms of nitrogen is a waste of resources. While the bugs chew and the fungi grow, trees are busy pumping all the important nutrients out of the leaves and into the stem and roots. These changes are subtle at first, but will soon be visible as autumn colors begin to develop. This is not to say the trees are free of disease. Many serious problems, especially wilt diseases, show themselves at this time of year. These diseases are often fatal, though usually slowly. It sometimes takes a degree of expertise to figure out whether sick-looking leaves are benign or signs of a serious problem. Wilt diseases that limit the access of leaves to water are usually fatal and largely untreatable. Sometimes, the services of a plant disease diagnostic lab are needed to figure out whether a tree is truly sick. Close observation of trees at this time of year can be rewarding. The development of autumn colors often starts very early. Some trees, such as walnut and hackberry, have already begun dropping leaves and turning yellow. 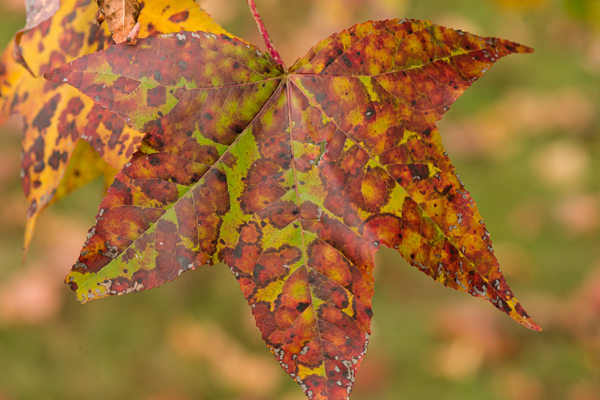 Posted in News, Tree Biology and tagged autumn, leaves, tree biology.